I think BoxBoy! took everyone by surprise when it was released in 2015. Coming seemingly out of nowhere, it delivered a puzzle platforming experience unlike any other, and a game dripping with minimalist charm. It got a well-earned sequel, BoxBoxBoy!, a year later, and now the third and final game in the BoxBoy! series is upon us. Make no mistake, Bye-Bye BoxBoy! is everything the conclusion to such a unique series should be. The basic idea is much the same as the first two games: you need to solve increasingly difficult puzzles, aided by the quadrilateral hero Qbby’s ability to generate blocks. It starts out quite simple as you create makeshift staircases and bridges to bypass obstacles, but each new set of levels as its own little quirk – conveyor belts, lasers, inverted gravity, that sort of stuff – that change how you put Qbby’s special powers to use. 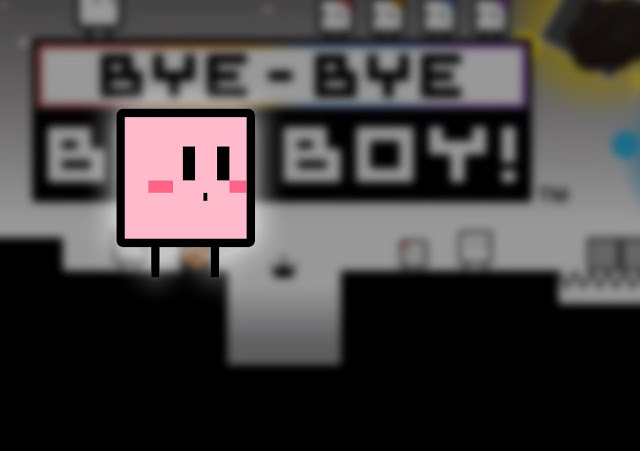 Bye-Bye BoxBoy manages to keep bringing up new ideas, even over the span of around 100 levels. That really is a testament to the creativity and ingenuity of the designers at HAL Laboratories. Some of the puzzle concepts return from the first two games, but a lot are brand new. In some levels, you have to guide a little “Qbaby” to the finish as well as Qbby himself, but the Qbabies aren’t as agile as Qbby and require more careful solutions. 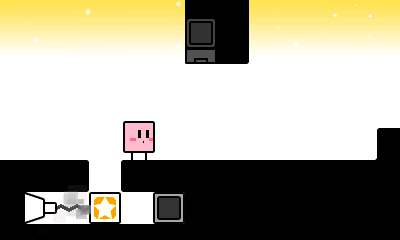 Other levels give Qbby’s blocks special properties, like turning them into explosives that can destroy obstacles or allowing him to teleport. There’s even one special block that lets you create a snake-like string of blocks that you can remotely control. 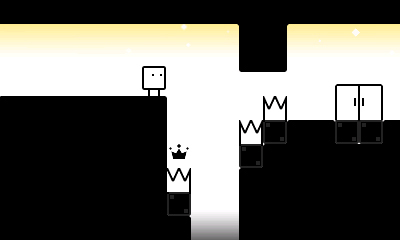 It’s everything that’s great about BoxBoy’s nifty approach to puzzle design, taken to new heights. On the other side of that same clever approach is the fact that Bye-Bye BoxBoy! – as with the previous games – makes puzzle solving an exciting one when it could very easily become tedious. Checkpoints are very generous and you respawn quickly when you die, so there’s nothing to discourage playing around with the mechanics and trying new things. It’s not quite a trial-and-error game, because every puzzle has a logical solution that can be calculated, but there’s nothing stopping a trial and error approach either. 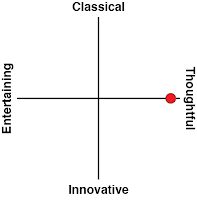 I think that’s an important balance, because you get the best of both worlds: you can solve a puzzle through logical determination, but when the solution eludes you, there’s nothing stopping you from experimenting and getting closer to the correct answer that way. If you get truly stuck, you can buy hints using Play Coins – you know, that 3DS system currency you earn from walking around with your system on hand. It’s nice to have that option, because Bye-Bye Boxboy! gets quite fiendish, especially towards the end. Some may argue that it’s a bit too convenient, but I’d much prefer that than to just get completely stonewalled by a puzzle I can’t wrap my head around, which is often when I give up on a puzzle game entirely. If you have a big stash of Play Coins (which is plausible, given how few games make any practical use of them), you could feasibly just use the hint feature to steamroll through the game – but if you enjoy playing that way, who am I to argue? The point I’m trying to make is that Bye-Bye BoxBoy! is a fine example of how to make a puzzle game that’s difficult, but without alienating players. It’s challenging, but in a way that’s encouraging rather than disheartening, and there are plenty of quality of life tools in place to keep the frustration at bay. Of course, this was all true of the first two games as well. Bye-Bye BoxBoy! isn’t some grand reimagining of the series; for the most part, it’s more of the same, and that’s exactly what I want from it. The aforementioned new puzzle ideas are enough to make this feel like a new game, but it’s all built around the same things that made the earlier games work so well. It does take the story to some new places, though – and yes, the BoxBoy! series does have a story. In Bye-Bye BoxBoy!, Qbby’s focused on rescuing Qbabies from strange alien planets while fending off the threat of an encroaching dark cloud. Simple? Sure, but it’s not simplistic; it’s the type of minimalism that opens the door to a lot of different readings. For my part, I found a criticism of war and the human cost that comes with, as well as a celebration of the camaraderie that often forms in the face of danger. I don’t doubt that many people will right this series off as being without narrative, but the minimalist approach is precisely what makes it so effective. What can’t be argued is how utterly adorable Qbby and his friends are. There’s so much expression in the animations, and the simple, clean aesthetic really brings that to life, to the point that these characters have more personality in a single square with eyes and legs than many games achieve with millions of dollars poured into the most technologically advanced photorealism available. 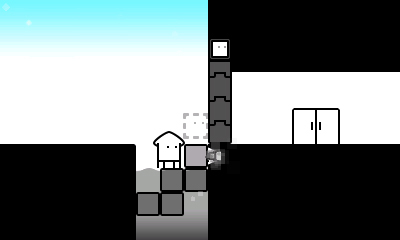 If there was ever an argument for art direction of graphical prowess, BoxBoy! is it. That personality also allows the ending of Bye-Bye BoxBoy! to be as poignant as it is. Naturally, I won’t share details, but I will say that can’t think of a more perfect way to close out this lovely little series. That goes for the whole game, really; it’s intended to be the final piece of the BoxBoy! puzzle, and it’s going out on the highest note possible.